First up - stream lining and working smart. A number of you, in fact an ever increasing number of you, keep telling me that you don't know how I do what I do. Ha Ha. Sometimes I don't know how either. But the truth is things are getting busier and I am having to delegate, stream line and work smarter. So here are a couple of things that I am going to do and some that I have done. Firstly, the BOM has now been handed over to Naomi from SA and Kylie from QLD to collaborate on and take care of. This month Naomi has taken it on and you will see her first BOM tutorial on Wednesday night. No hints! You will just have to wait and see what it is but if you can sew a nine patch and shoo fly you can sew this! taken on part of the management of the facebook page. She puts up the link to the blog every night and will answer some of the questions but will leave the PMs and the special requests to me. Additionally, wonderful Wendy from Melbourne is helping by working up a brochure that can go on the blog which all of you will be able to download when you want to tell someone about Aussie Heroes or ask beg for donations. She is also crafting some paragraphs for me to go into another publication because with the Canberra trip coming up there is no way I can even think about doing that till next week. Thanks so much girls - you are the best! Another thing I have to do is streamline email and question answering. If you get a very short email from me - short and to the point - please don't be offended. It probably just means that I am answering lots of emails and if I am not short I won't get them all done. I try very hard to answer all emails on the day I get them and to keep this up I need to be brief some times. So, please don't be offended. That being said, please don't hesitate to ask a question or pass on information. Also, if I can I am going to start answering questions on the blog so that everyone reads the answers. Just like they used to tell you in school, if you are wanting to know the answer, chances are someone else is too. So if I refer you to an upcoming blog post please know the answer will be covered in the next few days. If you think there are things that people are always wanting to know do you think I should create a Frequently Asked Questions Page? And if so, what questions should be posed and answered? Send me some suggestions if there is enough of a response I will get on to it - after Canberra! If I get a picture of a quilt top I don't file it. I may show it on the blog if appropriate but it can be, at times, quite a while before every top gets quilted. 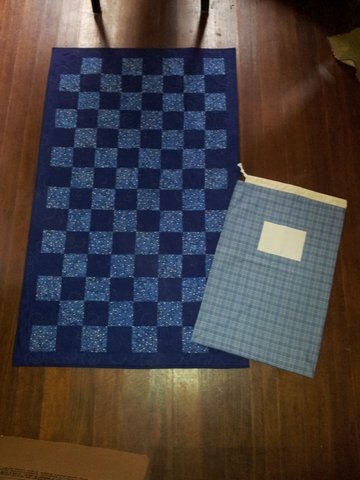 When you send me a photo of a completed quilt I put it into the Quilts in Waiting File. 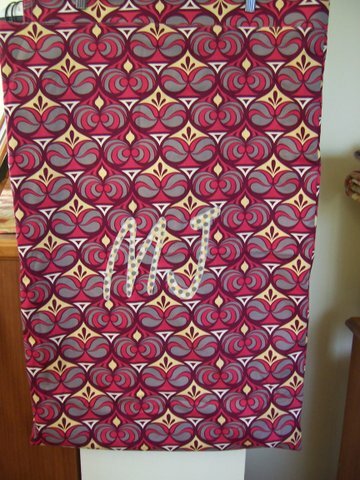 If a request comes in for which that quilt is suitable I contact the maker and ask them to send it off. Every time someone tells me a quilt has been posted I put a copy of the photo of the quilt into the coming Friday night's Quilts of the Week Post and file it away for posterity plus add it to the Gallery of Quilts. To make it easier on me could you please, please, please always send me a picture of the completed quilt top when you email me to let me know that you have sent the quilt off. If you had any idea how much time I spend going back though old emails to find photos of quilts to put on the blog for the Quilts of the Week post, as well as to move to the sent folder, you would understand. I may not have explained this very well but it won't take you long to attach the finished quilt photo to your "it is in the mail" email but it can take me a while to find it here and anything I can do to save time make a big difference. If you have any problems with this please let me know and we will see what we can work out. I have had a couple of emails from people wondering if there is any way we can chase up quilts that were sent in the Welfare Mailing lot in March and April. The simple answer is there is no way to chase them up at all. What happens is that for one month twice a year an extra post office box is opened up so that the general public can send care packages to the troops to show their appreciation. I have been told that there is a general inundation of packages at these times. Once the quilts arrive at AFPO 60, DNSDC (the Warehouse) sort all packages pro-rata to each of the different locations over there. A freight company transports them to the warehouse in location, the Chaplains then receive them and distribute them around the sections. I have been told that they wait for a full pallet before they send any. I hope to find out more about this when I head to Canberra. The simple fact of the matter is that when I started this venture that was the only way I could send bulk quilts over and we managed to send 125 quilts let alone all the laundry bags we sent. From that first batch of 125 we have only received a handful of responses so there is no way of knowing where the quilts went and who received them. I know of one and I shared this thank you message with you at the time and here it is again in abbreviated form. I just want to say a quick thank you for your support and care package. Love the Quilt its currently on my swag and everyone who sees it comments on it. It really did help me out and lift my spirits whilst I was building the Patrol Base Chakajuy. I am an Australian Engineer (Electrician) working on the front line with my fellow tradesman and plant operators. We are building an Australian and Afghan Patrol Base which is the most furthermost reign we, as an army, have operated in. It takes around 3 to 5 days road move to get out to the Patrol base with a few dangerous obstacles on the way. We are building the base so we can continue to Mentor the ANA (Afghan National Army). The Mentoring is challenging but rewarding in the end. We have finished the patrol base now and I am back at the Main base in TK that is why I can write this letter to you. Our counterparts are now slowly filtering in so we can get home to our friends and family back to sunny Australia. Being 3rd generation Army my family are proud what I’m doing and will be their to greet me when I return. Once again on behalf of my mates, we salute you for the package and encouraging words. If we had not sent the packages by welfare mail this fabulous young man would never have received one of our quilts. They slept for a month on the ground in pits with no running water and electricity whilst establishing this patrol base. There are other blokes, lots of them, who spend their entire time in Afghanistan sleeping on the ground or on stretchers. I spoke to one mum recently who said her son was so pleased that this time, for the first time, every time he comes in from patrol he has an actual bed to sleep on - with sheets! He goes out on patrol for three weeks or so then comes in for a short period, I get the impression it is only for a few days, and then heads out again. In those few days he gets his mail, gets in touch with his family, gets his clothes washed, eats proper food and rests. You can imagine all the things he has to do. I guess we can all understand why we are not on the top of their to do list. You also need to understand that a lot of these fellows have protected identity status. That means their names cannot be published nor their photos. They don't know us from a bar of soap. They don't know if we are aware of protected identity or not. I suspect that is also another factor. i guess what I am trying to say is that we should not be discouraged by the fact that on the whole we don't receive a written thank you for the vast majority of our parcels. I know what we are doing is appreciated without a doubt in my mind. I have been lucky enough to meet two of the fellows who have received our quilts and when I talk to them I can hear in their voices and see in their eyes how much what we do matters. When I receive an email from a mother or a spouse asking for a quilt for their loved one - I can't share all those messages with you as they are too personal but the gratitude is what keeps me typing away and answering emails most nights till 11pm or later. So, I guess what I am trying to say is that whilst it would be lovely to receive a thank you message from every soldier, sailor and airman who receives one of our quilts or laundry bags, it just is not practical. Whenever there is a thank you message shared on the blog we all just have to smile and know that it is meant for all of us. Having said that - just as I was about to put this to print - we got another one. This one is for Wendy and Nan via me. I came into work today and was surprised when I saw a package on my desk. When I opened the package I was even more surprised when I saw that it was the Aussie Hero quilt, laundry bag, beanie and also some goodies. There was also a letter from Wendy L & Nan. I would just like to extend my greatest thanks for the package and not only the quilt, laundry bag and goodies but also the letter. I will really cherish this. Can you please thank Wendy & Nan for the wonderful package. It really made my day. Thanking you again from the bottom of my heart. And I have already got a request from someone who saw his parcel and would love to receive something similar. Anyone interested? Just let me know. for any of you lucky Victoria ladies! They are good quality....and they are the Australian Flag. So I bought about four. I must admit I was surprised to find them there. But jumped at them for my Aussie Hero Quilts I want to make down the track. tonight because tomorrow night is the launch of the new BOM. When I was little I used to love getting mail and all of my family had lots of penpals so there was always mail coming in. Then I joined the RAAF at the tender age of 19 (I thought I was so grown up but now I know I was such a kid!) my folks and some of my girlfriends made sure I got lots of mail. I still love checking the mail but with Aussie Heroes it is extra good as each parcel is another donation! Today my post office handed over four or five parcels and with a smile asked me to stop making them work so hard! 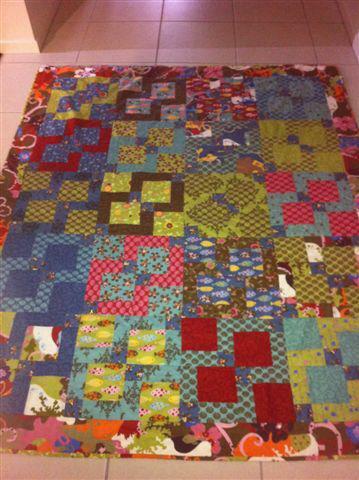 Sue has posted these goodies - around 900 3 1/2 inch squares for turning into nine patches and the like to Nancy in WA. Nancy sits and sews blocks while her electronic quilting machine is doing its thing. 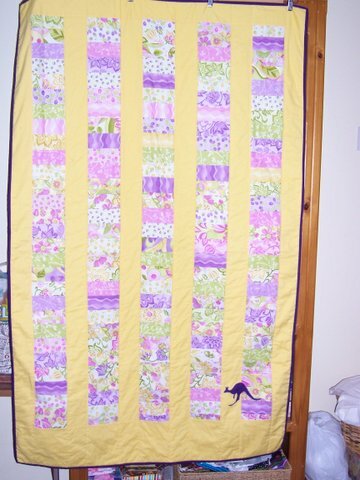 Gina sent me this quilt top - love that Aussie Fabric. Kaye sent me this neat top - that orange just makes it pop! Lyn from Mt Helena WA sent in this fabulous laundry bag. She used the same twill that she uses to make her son, the chef, his aprons! Best dressed chef I reckon. Love that fabric. I really need to find a cook to send this one too. In fact if anyone knows a cook or two please let me know as I know of one great foody quilt coming up as well. with the fresh green and cool blue! lots of cool Aussie fabrics in these. Fran also sent over these flag panels - a dozen of them. I think these things are like gold as there are probably not going to be any more of these printed in the future (although we can always hope) and the addition of one of these just makes a simple layout special! As far as donations are going these are the last but not the least! Last Friday you saw the two great quilts that Michelle sent away. One of them had these panels on them - they are machine embroidered but they actually look hand done and I love them. Michelle offered to do some more and send them to me for incorporation into a WWQ. How neat are they? I even love the Aussie Flag although Mitchell ran out of blue thread so she couldn't do the scrolling around he outside but I think this might come to life with a little colour. I have been seeing some pictures coloured in with crayons on other people's blogs - maybe that flag could be coloured in which would make the stars stand out. Hmmmm...food for thought. What do you think? Three more quilts made it into the Quilts in Waiting File. The first two by Judith. You just can't beat the Aussie Flag! 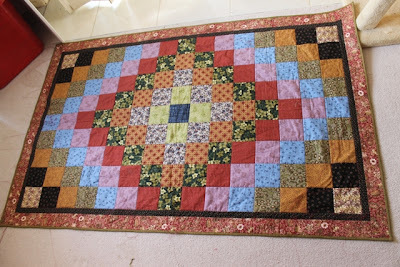 Finally this one was worked on by the Turramurra twins using up the last of the April BOMs and quilted by Kim, one of our very generous long arm quilters here in Sydney. Phew! That is enough. Two sleeps till I leave for Canberra. Baking and packing tomorrow. Till next time.............keep spreading the word and happy stitching! Well good evening again! Especially all of you "over there". email, comment on the blog, leave me a Facebook message. just in case you need anything! Yesterday I received an email from Cindy who is does not sew but it happy to contribute to the Aussie Heroes cause in a different way. Here is her email. 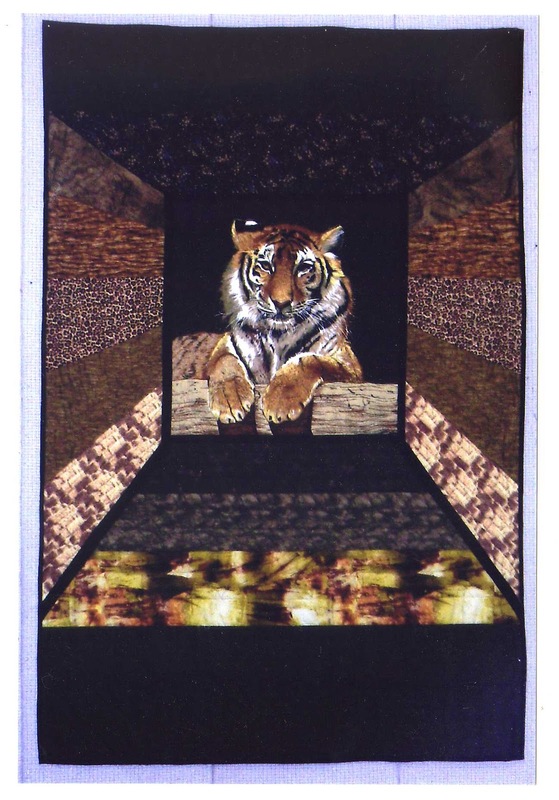 While I am not a quilter, I am a digitizer and would love to help somehow. If you are in need of digitized designs for machine embroidery, let me know, I would be happy to help. Time for another special request. If anyone can fit in making a quilt or a laundry bag for this fellow please let me know - email, Facebook message or comment below. Well it is all about packing and sorting here. Four crates of fabric and four bolts all packed and waiting to be loaded into my car on Thursday. A whole bunch of quilts to sort and fit into the suitcase for show and tell at the Canberra Quilters Meeting and the Duntroon Sewing Day. Please note the lovely pink trim on my suitcase - chosen especially so that none of the menfolk in this family will use my luggage! Laundry bag kits all stacked and waiting to have their labels fused and ready to go - tonight's job hopefully! The Lovely Warrant Officer's Wife and I are hoping to collaborate on a WWQ during the sewing day! I cannot think of a nicer things to do. All my Aussie fabric is packed and ready to go. All that is left is to organize my paperwork, practice my speech, prepare an information pack for each of my meetings, print up instruction sheets for laundry bags and specification sheets for quilts, leave a couple of meals behind for the hubby and boys, write a few blog poss in advance and pack my clothes! Oh, and bake some yummy treats to give to a certain Warrant Officer and his family (if he is prepared to share!) That is my job for Wednesday! Till next time..............keep spreading the word and happy stitching! Hi all. I hope you have all had a lovely weekend where ever you are and that includes all of you lovely people "over there" and you wonderful wives, husbands and partners keeping the home fires burning! Gasp! Only four more sleeps till I pack the car and head to Canberra. Hope I don't forget anything! Over the last few weeks I have been doing a bit of research with regards to the sizes of our quilts. I wanted to make sure that the size was right. What we are aiming for is a quilt that is wide enough to sit on top of a single bed and long enough to go from under the pillow to the foot of the bed. I also want it to be versatile enough that a big burly fellow can wrap it around his shoulders whilst sitting around a camp fire - a shorter wider quilt will not do this job hence our longer skinnier versions. What I have accidentally discovered is that some of the quilts sent over are shorter than the prescribed size, and though they may have been beautifully constructed, are not really practical for more than a lap quilt and that is just not as versatile as we need. So, I decided to use tonight's post to reinforce the specifications for our quilts. I have also re-written the quilt specifications page listed above to reflect the changes. If anyone finds anywhere that the sizes of the quilts are mentioned where I need to make further changes please let me know. From now on when you start a new quilt could you please make your quilts 42" wide (or width of normal patchwork fabric) and from 70-75" long. Please use only cotton batting for versatility and breathability and bindings can be machine or hand sewn. Each quilt must have an Aussie Hero label on it - you can print these using printable paper or you can hand write them using a pigma pen or similar. with gratitude for your service. I have included the new email address but use up any you already have with the old one - I will be! Also feel free to add a line at the end that says who the quilt was made by of course. Of course it goes without saying that if you have a quilt underway and can't lengthen it, don't worry. Just plan for it for your next one. Lately a number of people have commented on how hard it has been to get their quilt into the box. I can only assume this has something to do with the choice of batting. Just for information I use the thinnest cheapest cotton batting for ALL my quilts and find it great to quilt with but also have no problem getting the quilts into the boxes. Maybe a thinner batting will help. Don't for get your July BOMs. The month is nearly over and we have received some lovely ones. If there are any more out there can you please let me know. Another couple of thank you messages! Caroline sent of this great quilt and today she received a thank you email. I just wanted to say that your quilt and laundry bag arrived today. Thanks so much, they really are great, and I love the touch with the ANFs (Australian National Flags). You have done a fantastic job with them and its is nice to have something truly special from someone back home who appreciates our efforts. 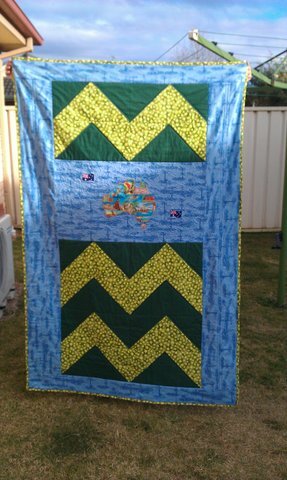 Please pass on my thanks to all the other ladies who are helping to make Aussie Hero Quilts for personnel serving overseas. I want to say, Erika and Marg, Thank you so much for the quilt and laundry bag you made for me they are brilliantly made and will be a wonderful keepsake for ever as a reminder of my Service for our country and that we had the support from the people that mean the most to us, the Australian public, the quilt has pride and place in my room and the laundry bag will be used very much during the time I have left here. I will get a couple of photos later to send to show off your wonderful work. We all are glad to hear of all the wonderful people like yourself who are thinking of us over here. Good for Aussie Heroes but .....Hmmmm I am having to get used to having my photo taken - Honestly! The things I do for Aussie Heroes! This is probably the only thing I don't like! And don't forget our next sewing day! to sew for Aussie Heroes in Canberra? On Saturday the 4th of August we are looking for your skills and your time to help us create more quilts and laundry bags. All materials will be provided and instructions available where needed. All you need to bring is your sewing machine, a neutral thread and a smile. The Centre is located on Gymkhana Drive in Duntroon. You don't need ID to get on the base so everyone is welcome. Tea and coffee provided. BYO lunch and snacks. Please note - they are a nut free centre as a 3 year playschool runs there during the week and a couple of the children are highly allergic. Till next time.......keep spreading the word and happy stitching! Quilts of the Week 27 Jul - Bumper Crop! Hooley Dooley! What a week! Last Friday we had 309 follows on Facebook. As of the time I publish this we are up to 347! Again I am going to say G'Day to our readers in The UAE, Germany AND this time Afghanistan. You might be too shy to day G'day back but we are glad you are checking the blog out and hope you are encouraged by what you find. We certainly have a bumper crop of gorgeous quilts heading off to all sorts of places. I sent one too but I can't post it as the fellow who is receiving it knows I made it and I don't know if he reads the blog but there is no way I am going to spoil the surprise! A wonderful new sort of request is coming in now - bosses are requesting quilts to surprise their troops as we saw with Grandpa's quilt earlier in the week. We have another four quilts heading off for just that purpose this week - I made one - and I so can't wait for it to arrive and all the rest of them. What nice bosses. This week another soldier received a quilt from us, this time from Sue in SA - out of the blue for him - but requested by his wife and he was so pleased that he is now passing on addresses to have them sent to friends and workmates of his - people who he thinks will appreciate the work involved. He is even encouraging his wife to start making quilts for us once he is home again! Love it! He sent this lovely thank you to Sue for his quilt too. I would like to thank you for my quilt that arrived Saturday. I was quite humbled when I opened the box, as I had no idea what it was. I love what you have created and it will always have a special place in my house. My Mother also makes quilts so I can appreciate the amount of time and effort that is placed into every quilt. That fact that this is all done on a volunteer bases has just blown my mind. I will also include some photos for you once I get a chance. This can be a difficult task as my work day most days does not allow for a lot of down time. I am not sure what else to say as I am still some what humbled by the entire experience as I just think of myself as an average soldier doing his job that doesn't need any recognition. This is why it is nice from time to time for someone like yourselves to come a long with a thank you like that. Again I can't thank you enough for your time and effort. Well it goes without saying that if his mother is a quilter then he comes from good stock. If all Australian men were as "average" as he says he is our country would be in a much better shape! And now to this week's quilts. It doesn't show up well in the photo above but Michelle has done these lovely embroideries and then pieced them into the quilt. She is going to do another set for me so that they can be included in a WWQ! Wish I had neighbours like that. Next time faces with big smiles too please! Chris's group from SA are sending off some of the results of their labour too. but I think this is my favourite of these three - just can't beat the disappearing nine patch! Naomi made a strippy quilt as you go quilt. She was given some scraps to use and look what she found. Clever girl managed to get it into the quilt and the right way up too! As far as I know Naomi is fronting up for Aussie Heroes today for an interview with WIN TV in country SA. Hopefully they will send me something I can put on the blog. Guess we have our own TV Diva now! Khristina sent this one off last week but I could n't work out how to save the picture off Facebook till Kylie told me how - yes I am that pathetic! Jacqui made a lovely soft and pretty quilt. Kylie made a gorgeous "trip around the world" which is kind of appropriate. This was requested by a hubby for his wife - don't we love a thoughtful guy! Pauline was extra brave and took on two quilts and laundry bags. are going to be so welcome in their otherwise drab environment. Carol pieced and Kelly quilted this great quilt. 415 quilts and 271 laundry bags! Got to be happy with that! And the last word goes to one of our recipients. 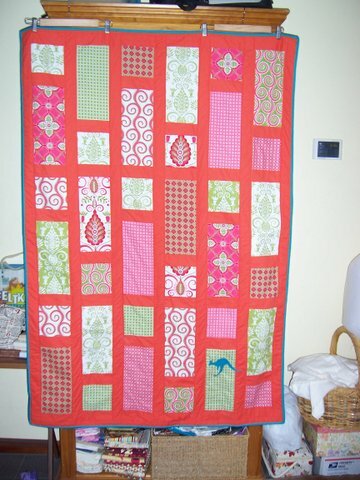 Carolynne sent off her lovely pink quilt and this week received a great thank you message AND photos! I was absolutely thrilled to recieve the quilt and laundry bag which you made for me in the mail yesterday. Everyone gets excited on mail day, and I was extra excited when I saw the Aussie Hero Quilts label on the box. The pink and black are perfect for brightening up my bunk and making it feel more like home. I also love the patterns of the embriodery across the quilt, I imagine they took a lot of your time to create. I wanted to thank you not only for the quilt, but for what it represents. We work long hours and live in cramped conditions and the time difference sometimes makes it hard to stay in touch with faily and friends. It is such a boost to know that people back in Australia support us and are thinking of us. 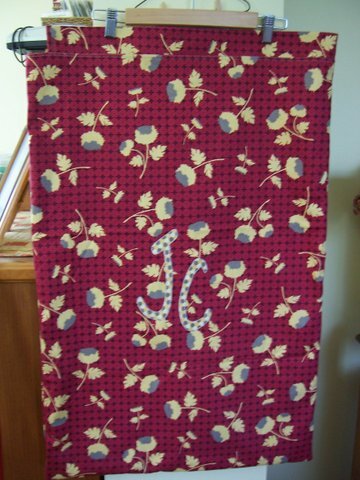 I have attached some pictures of the quilt on my bed and the laundry bag (already in use!) so you can see how much it brightens things up. Till next time................keep spreading the word and happy stitching! Happy Mail and a bit of cheek! Party of Two in Penrith! We have a bank account!!! Quilts, Laundry Bags and String Blocks!